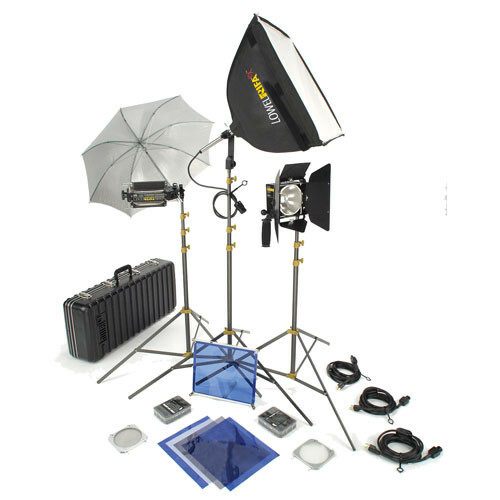 The Lowel Tota/Omni Core 44 Kit features three of Lowel's most popular fixtures. Compact, rugged and versatile, the broad-throw Tota-light can be used with its umbrella or gel frame and diffusion as a soft key light, fill light, or backlight. With its adjustable reflectors, it can be a smooth and even background light, or point it at the ceiling to raise the ambient (base) light level of a room. Tota-lights are also widely used for photographic copy work. The Rifa eX 44 softbox light has a 16 x 16" (41 x 41 cm) front diffuser. It has an umbrella-like design allowing set-up in 60 seconds or less. Its quick-change power cord easily converts for use with professional battery belts, allowing it to work at 12V, 14V and 30V DC in addition to 120V and 230V AC. The Rifa eX has a changeable socket, to make use of cooler-running fluorescent bulbs. Box Dimensions (LxWxH) 31.75 x 19.5 x 8.0"
Tota/Omni Core 44 Kit is rated 4.0 out of 5 by 1.